You're 18 to 25 years old? You want to live a rewarding and constructive experience? You'd like to take some time to think about your future while being useful to society? The Citizen Service is made for you! The Citizen Service is a 6-month programme that gives young people the opportunity to commit themselves to solidarity-minded projects. Through your commitment to helping others, the programme aims at reaching the following goals: building up your self-confidence, making you feel useful, helping you settle into a regular rhythm, giving your life more structure, and helping you build your own future. In short, we hope that your Citizen Service will give your life more meaning and enable you to find your place in society. The Citizen Service is an opportunity for you to develop personal, professional and civic skills. The programme is centered on solidarity, friendliness,inclusive culture and embracing diversity, emancipation, learning through experience, social engagement and mobilization. You will spend 80% of your time carrying out your main mission, additional missions and taking part in international work camps. The remaining 20% will be devoted to training, personal growth, defining your plans for the future and sharing with other young volunteers. What to expect from your Citizen Service? You will attend various training sessions, including one on sustainable consumption, and first aid courses for the Red Cross' European First Aid Certificate (EFAC). You will also visit the European institutions, attend a political rally and take part in many other activities that will add value to your curriculum vitae. You will receive a compensation for each day you commit to your Citizen Service. You will be covered by insurance. At the end of your Citizen Service, you will receive a certificate acknowledging your participation and commitment. 1. Contact us by phone 02/256.32.44 or by email communication@citizen-service.be. We will arrange an appointment to give you more information about the Citizen Service programme. 2. Choose three missions that you would like to carry out during your Citizen Service. You can find a list of missions here. If you can’t use the internet and read about it online, there’s no need to worry : we will give you all the information you need during our first appointment. 3. Download the application form or make an appointment with one of the Citizen Service’s tutors who will help you fill it out. 4. 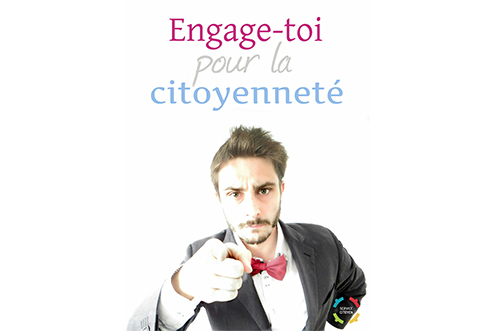 Complete the application form and return it by email to communication@citizen-service.be or by mail to the following address : Plateforme pour le Service Citoyen, rue du Marteau 21, 1000 Bruxelles. Your Citizen Service will start with a 4-day integration week, near Brussels or in Wallonia, during which you will get acquainted with the young people starting their Citizen Service at the same time as you, and the tutors who will guide you through it. It's that easy to start your Citizen Service. Now it’s up to you to get involved!